A big part of sports is about seizing an opportunity. And that's exactly what Anaheim Ducks goalie John Gibson did. In his postseason debut, the American proceeded to shutout the Los Angeles Kings. It was just his fourth NHL start. A few nights later, Gibson was back in net and proceeded to save 39 shots in a 4-3 Ducks victory. Needless to say, many collectors are starting to scramble for the few John Gibson rookie cards that exist. The Ducks picked Gibson in the second round of the 2011 draft. The goalie helped lead Team USA to a gold medal at the 2013 World Junior Championships. He was also named the tournament's top goalie and MVP. At the time of his postseason emergence, Gibson had just three rookie cards as well as a handful of inserts. 2013-14 Panini Playbook and Fleer Showcase both have autographed rookie cards. 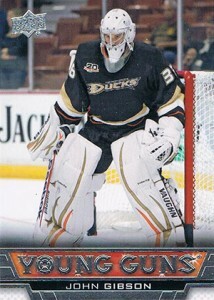 There's also a John Gibson Young Guns card in 2013-14 Upper Deck Series 2. Collectors can expect to find more cards of the goalie in the final releases of the season. 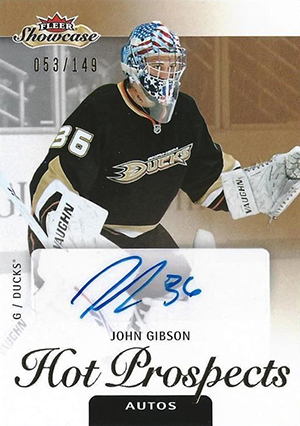 The first major John Gibson cards were issued in 2012-13. In the Game included him in Heroes and Prospects and Between the Pipes. Both minor league products have autographs and memorabilia cards of the American goaltender. Another intriguing option is the 2012-13 Post Cereal CHL John Gibson card. Please note that with more 2013-14 products to be released, there will likely be more cards added. Although he's not included on the Hot Prospects Autographed Patch portion of the set, the 2013-14 Fleer Showcase John Gibson rookie has some good things going for it. The first is that's it's autographed. Numbered to 149, there also aren't very many of them. Gibson also has an Ultra insert in the product that's numbered to 499. There's a lot going on with this card. It's signed, it comes with a pair of swatches, it's numbered to a small 199 and it's a book card. That's a lot of premium elements squished into one. It might not have an autograph or a serial number, but the 2013-14 Upper Deck John Gibson is part of the Young Guns subset, which gives it a boost over other basic rookie cards. Like other Young Guns, it is a short print but not incredibly tough to find. One of the hallmarks of Artifacts is the Rookie Redemption cards. When they're first released, they're a mystery, often connected to a specific team. Gibson has been announced as number RED241 in 2013-14 Upper Deck Artifacts, though the redeemed cards have yet to be released. JOHN GIBSON,13-14 THE CUP, ROOKIE PATCH AUTOGRAPH, ANAHEIM DUCKS ROOKIE ! NICE !